Hi there! Today i'm gonna show how to insert(add) fragments dynamically. How to replace it thru other fragments with totally diferent layouts. This is a very common task while developing scalable, reusable and good looking apps. There are some restrictions you must know, while handling with fragments. First: You can only replace fragments which has been added dynamically. Burn this in your mind! ;-) I will be helpful! Believe me! Second: You must define a "placeholder" layout, which will be your point to insert(add) and replace fragments with. 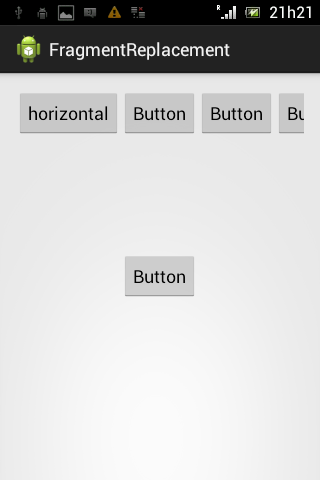 Create a new Android Project with a blank template. Call it FragmentReplacement. Ensure that you have defined the "minsdkversion=11". The main difference here is that the layout will change it here from horizontal to vertical. This because we wanna see the beautiful effect from having and using Fragments. 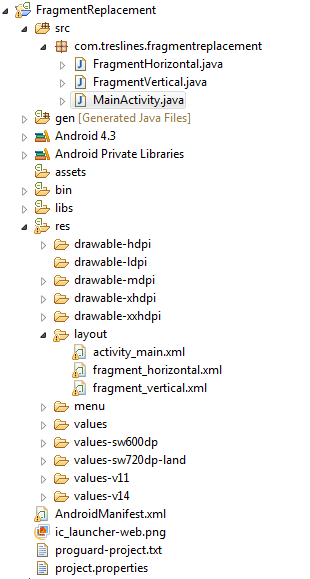 Name it "fragment_vertical.xml" and again copy/paste the next code section in it. Create a new class and name it "FragmentHorizontal". While creating a new class, be sure you extend it from Fragment when using the "New Class Wizard". Or just copy the code into your new created class. That's a very simple class. 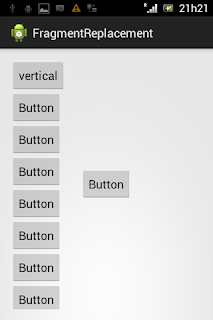 It is only responsible for creating a new Fragment from the given layout we have just defined in the sections above. If everything went well, you should see something like that. Great article. 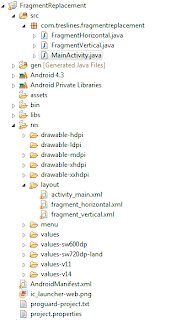 However just for my conception shouldnt layoutToReplace actually be the container layout. I mean doesnt the fragment get added to the container rather than replacing it ? What if we do transactions several times? We would create every time new FragmentVertical, FragmentHorizontal? Should't we reuse them if they were already created? Greetings from Florida! I’m bored at work, so I decided to browse your site on my iPhone during lunch break. I love the information you provide here and can’t wait to take a look when I get home. I’m surprised at how fast your blog loaded on my cell phone.. I’m not even using WIFI, just 3G. Anyways, awesome blog! Good Post! Thank you so much for sharing this pretty post. My blog is in the same niche as yours, and my users would benefit from some of the information you provide here. Please let me know if this ok with you. Thank you.